Yet the concept of cache is so easy to understand, you don’t need a degree in anything. Moreover, it turns out cleaning cache on your WordPress site is super-duper easy you can do it before the next guy makes a cup of coffee. And in today’s post, we show you exactly how to clean WordPress cache like a pro. By the end of the post, WordPress cache will be one thing you needn’t worry about ever again. You’re welcome to opine and share your experiences in the comment section. Think of it as moving the remote controller from the media cabinet to wherever you’re seating. Next time you need to change the TV channel, you can do it faster since you don’t need to walk to the media cabinet all over again. The next time you visit said website, the cached content loads from your browser rather than the origin web server. This means the data isn’t sent over a second time, since it already exists on your browser/PC. The end result is a faster experience, saved bandwidth and reduced server load. In a bid to provide a better user experience while browsing, modern day browsers come fitted with caching capabilities. Whether you are using Chrome, Mozilla Firefox, Edge or Safari, your browser automatically caches content from the websites you visit. This way, you experience faster loading when you visit a cached website subsequently. Your WordPress site can take advantage of browser caching to deliver a faster experience to all of your users. You can establish caching rules for your content, ensuring your server receive queries for new content only. Then we have plugin cache, which represents all the temporary data your cache plugin saves. Depending on your preferences, your plugin cache might include HTML files, compiled PHP code, MySQL queries, and web objects among other things. If you recall, we have severally said WordPress builds web pages from PHP and data queried from your MySQL database. Now, instead of recreating pages each time a user visits, your cache plugin serves the saved copies easing the load on your server, which translates to better performance. Caching also reduces the to-and-fro transfer of files. Most hosting providers offer caching features to speed up your WordPress sites. This is especially the norm with most managed WordPress hosts such as WPEngine, Flywheel and Pagely among others. The foregoing links redirect to support pages showing how you to flush cache for each host. It’s all about improving the speed of your WordPress website, this caching business. Each host uses a different type of caching architecture depending on their setup, but it all boils down to just one thing – improving performance. It’s best to consult your host in the off-chance you have a problem with your server cache. Some hosting companies create cache locally and others use advanced techniques such as reverse proxy servers. This just means placing multiple cache servers “in-front” of the main server. First-time requests will be made to the main server but subsequent requests are served by the cache servers. The hell is third party cache? Good question. If you use a web application such as CloudFlare, StackPath or Sucuri, note that one of the first things they do to improve the performance of your WordPress site is build cache. As a matter of fact, I have seen a website using 3rd party cache to create the illusion of being online, while their website was completely down. Visitors to the domain were redirected to a cache, which is way better than, well, nothing. Only dynamic content such as media downloads were missing. Static pages were all there. Where Are We In All This? At this juncture you no longer think cache is an alien monster you should fear. Indeed, knowledge is power. But seeing caching is great for your WordPress site, why would you want to clear your cache in the first place? Firstly, if you make changes to your WordPress site but don’t see the updates after hitting refresh, you may need to clear your WordPress cache. And by this we mean any or all of the four types of cache we outlined a moment ago. Secondly, changing settings inside the admin can break your site’s design. At this juncture, cleaning cache after making the requisite changes is a no brainer. Otherwise, you and your visitors might continue seeing the broken design. Thirdly, pages might get modified on the server during the caching process. Other times, cache that has been misconfigured will serve stale content to your users, which is just sad. 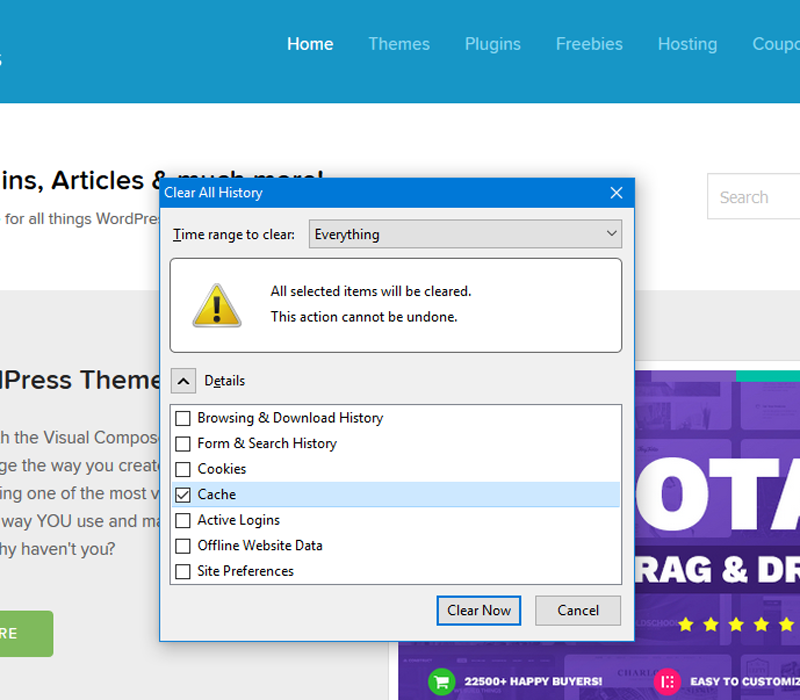 Both times, cleaning your WordPress cache is your saving grace. The best part of this guide, cleaning your WordPress cache is as easy as A, B, C. In extreme situations, you might want to contact your host if you believe the problem lies with server cache. In most cases though, the three scenarios we mentioned a few secs ago are due to browser cache or cache plugins. Let’s start with the easiest to clean. Formerly known as Internet Explorer, Edge is Microsoft’s attempt at reclaiming a market they once dominated. Edge is a significant improvement of what most people know as the mother of all web browsers. While I always choose Chrome, Edge is not badly off. How to clean cache? You can even choose to clear cache automatically every time you close Edge, a feature not found in the other browsers. After cleaning your browser cache, reload your WordPress site. Did you resolve your cache-related problem after cleaning browser cache? If the problem persists, the other most likely culprit is your cache plugin. The procedure to clean WordPress cache here depends on the caching plugin you use. All the same, cleaning WordPress cache using a plugin is as simple as clicking a button. Let’s get this over and done with. W3 Total Cache is one of the most popular WordPress cache plugins out there. With over 1 million active installs including the likes of AT&T and MakeUseOf among others, this caching plugin is something else. It ships with a great suite of features that promise better performance and conversions. Brought to you by Automattic, the same guys who gave us many other awesome products such as Jetpack, Akismet and WooCommerce among others, WP Super Cache is a remarkable WordPress performance optimization tool. And there you have it – all the best ways to clean WordPress cache like easily and in record time. How do you clean cache on your WordPress site? If you have a question or suggestion about WordPress cache, please don’t hesitate reaching out in the comment section below. I know it’s a premium cache plugin, but WP Rocket just rockets!